The Lonely Planet suggests that when you only stay in Dubai for one day, you shouldn't try to see the city's architecture, and rightly so. The architectural wonders are spaced so far apart; it's more than a day's task to get to see them all. I first waited at my hotel, calling the airport every 45 minutes to check on the status of my flight. At 9:30 I was told that, for sure, the plane would leave today. Not so. Five minutes after I arrived at the airport, I was told my plane was canceled. Leaving my hotel, I asked, just in case, if they had a room left for the coming night. I was told that I had to be quick in deciding and tell the receptionist before 12. When I called him, 11:30 or so, the hotel was fully booked. I had to call about ten other hotels before finding a free room at an abysmal 75 euros. Cockroaches thrown in for free. By the time I left my new hotel it was already 2:15 and I wanted to hurry to get to see some of the buildings. 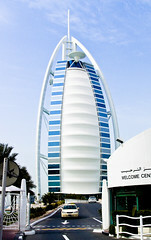 First stop was the Burj Al Arab, the hotel on the sea shore shaped like a catamaran sale. It's huge but doesn't allow visitors on its premises anymore so I could only admire it from afar. It's possible to get a guided tour through the tourist, at steep prices, but I didn't think that a very good idea. My second stop was Palm Island, the artificial island shaped like, yes, a palm three. Hordes of Indians still beaver away at it and I wasn't allowed within what seemed like miles from the entrance. Even looking at it in the distance, whipping out my camera, I was immediately whistled back by some of the guards. At first i had gotten off the bus at the wrong stop, way too far, and thought I had stumbled into some Arab's dream of playing SimCity. Everywhere i looked, Indians where building 20, 30, 40 story buildings. Another day over, I headed back to the Dubai creek and sat alongside it, sucking a sheesha and drinking tea, wondering if my plane will be flying tomorrow.